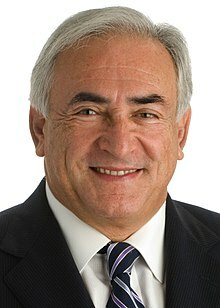 Dominique Gaston André Strauss-Kahn (French pronunciation: ​[dɔminik stʁos kan]; born 25 Aprile 1949), is an umwhile French politeecian an a controversial figur o the Socialist Pairty wha haes been involved in several financial an sexual scandals. ↑ "strauss kahn takes the-stand in french pimping trial". The Times of Israel. 9 February 2015. This page wis last eeditit on 18 Julie 2017, at 22:30.